As a child we see things that we take with us into adulthood. A boy fascinated with planes may become a pilot. A girl fascinated with horses may ride into equestrianism at the Olympics. However, not all fascinating toys and objects have to lead into a profession. Some of our favorite objects we’re able to turn into hobbies and keep in our day-to-day. Black Forest Hobby Supply does just that by supplying figures, locomotives and train sets to electronic railway enthusiasts. 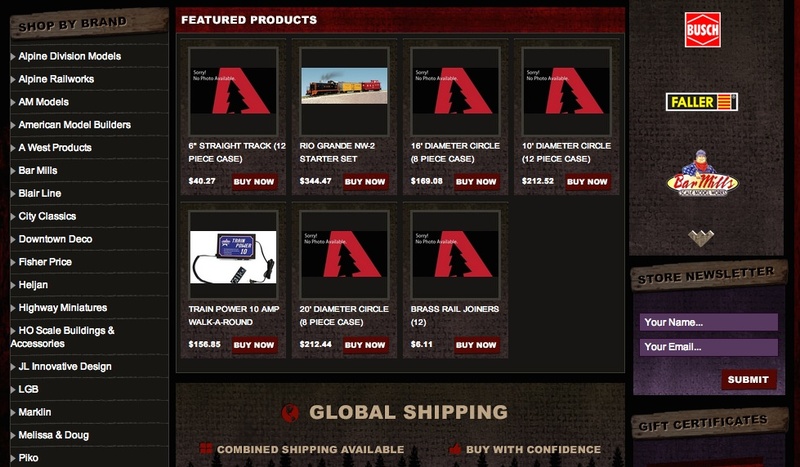 The supply shop has taken the first train to a new BigCommerce storefront design supplied by OC Designs Online. Creating your own town with a railway system and community is now simple and easy at Black Forest Hobby Supply! The header and welcome pane of this BigCommerce store design is rustic and woodsy to keep with the theme of the store name. The logo is in a white and red font on a dark background to make the letters reach from the screen. Below the store logo is a panel that holds tabs containing valuable information to online shoppers. These tabs include a Home, About Us and Contact tab so customers can stay informed and get top-notch customer support come day or night. A slightly violet box in the right hand corner holds the phrase “Type Keyword”. This box enables shoppers to search for inventory or questions on the site with ease. Finding the perfect locomotive is just a simple search away! The midsection of this store design highlights store categories. A visual of pumpkins spilling from a wicker basket bring a comfortable feel to the hobby store. To browse store inventory all one has to do is click on a specific category on the left hand side or click the “Shop Now” tab on the far right hand side. Both tabs take shoppers directly to products but one has a more clear and precise route! Much like a train conductor you’re able to navigate to your desired location! The footer of this store design brings products directly to the online shopper. Visuals of top products are accompanied with a description, price and option to “Buy Now”. This section enables customers to see items they typically wouldn’t browse and find new ideas for their projects. Also, people browsing can’t miss the perks included in the footer of the store. Global and combined shipping can easily trigger one purchase into turning into two or more! For a customized, one-of-a-kind BigCommerce shop design come browse the options at OC Designs Online. We take ecommerce shop design seriously but never lose the fun in it all! Take a moment to browse our portfolio and request a free quote. We have a feeling you won’t be disappointed!